Every Thursday in my creative writing class, students take over with music. I typically ask the student to write the title and artists on the board. We pull it up on YouTube on my computer or plug my speakers into their phone, then I set the clock for twenty minutes. We listen. We write. Well. My job as a writing teacher is coming up with writing prompts, which students write in their notebooks. Every three weeks or so, we have a "Roundtable," for which students develop a 'notebook idea' into a full-blown poem, script or story. I'm always curious to see which prompts inspired students to develop a full-blown story. Overwhelmingly, I find students working to finish prompts inspired by songs their classmates had brought in. Today was Ryan's day. She wrote on the board, "Star Trek Into Darkness: John Harrison Theme Extended," Michael Giacchino. I commented briefly on the selection, then I turned out the lights (students write on computers anyway), and the music began. Here's the video I used. Marvel pulled his jacket tight against him and pushed his way against the Belorussian cold. It was November in Minsk, but it could just as well be February, December, or even May for that matter. The cold attacked like demons, finding any opening in one's clothing and just pouring inside, turning smooth skin to goosebumps. Minsk. What is that place? Other than a spot on a map, the capital of Belorussia, I had no idea what went on there. Writers' Block began. I opened up another tab in my browser and went to Google Maps to find the city of Minsk. I zoomed into what looked like a main boulevard, dragged the yellow person figure, and set it down across the street from a nice, leafy park. I suddenly had a 360-degree view of the Belorussian Circus theater. 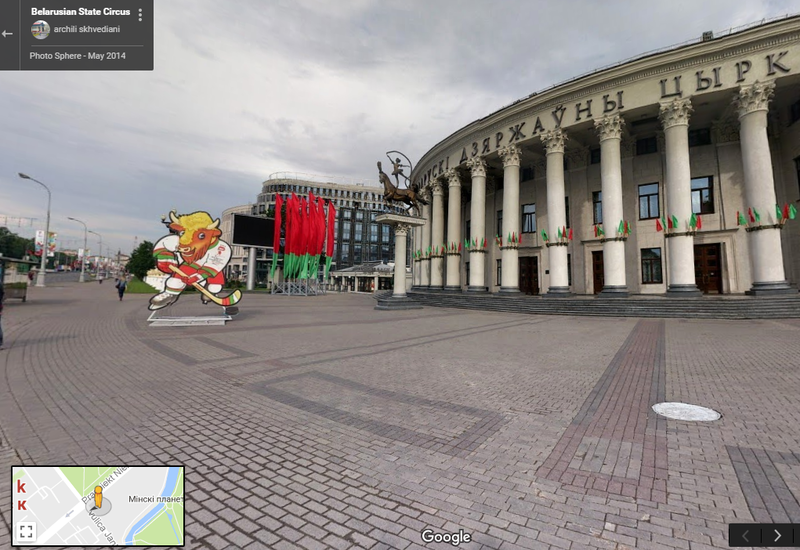 More googling revealed that the bison logo outside the theater was the mascot for Minsk's professional ice-hockey team, HC Dinamo. Writers' block was ended. My scene continued through the square. There was another reason why Marvel pulled at his collar. By doing so, he activated the mic hidden there. 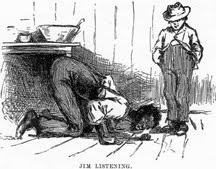 Static burst into his left eardrum, and a voice said, "Do you copy?" Marvel hummed a little song to himself, something about a shepherd boy asleep on the hay, but the verse ended with the strange words, "Please repeat." "T-minus five minutes for the drop-off. You are to meet beside the logo of HC Dinamo. Do you copy?" Marvel looked across the cobbled square. Just outside the palace of sport, red-and-green flags fluttered in the breeze. In the middle of the square stood a cartoon cut-out of a bison dressed in the red-green uniform of Minsk's favorite ice-hockey team, lunching at a puck with a hockey stick. The square was crowded. With people, even though game time was still two hours away. The Kontinental Hockey League playoffs began tonight. "Copy," Marvel said, clearly this time. "The operative word is Samsung. Do as directed. Over and out." The line went dead. Marvel looked to the front of the palace of sport. Policemen there scanned the crowd. He tried to tug at the jacket again but didn't for fear he would draw attention to himself. The bison cut-out was surrounded by groups of people waiting patiently to pose for selfies next to the mascot. Many of them were wearing jerseys, excited for the game to begin, the first game of the Gargarin Cup. "Excuse me." Someone tapped Marvel on the shoulder. "Could you take a picture with my new Samsung Galaxy Six?" "Nice phone," Marvel answered nonchalantly. "What would you like me to do?" "Take a picture of my girlfriend and me." Marvel looked at the girl. Brown hair. Face painted in red and green. "She's pretty," he said. The girl smiled--a stressed smile, Marvel noted, she wasn't playing along very well. "Take the picture, I can share it with you." The man put his arm around the girl. She gave a "number 1" sign. Google Maps is a great solution to writers' block, and a fun way to both learn about the world and become more creative.